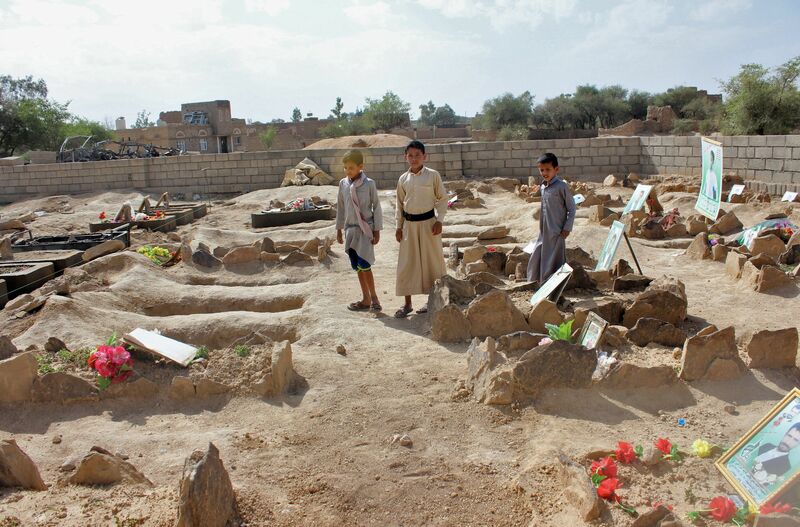 SCOTS council pension funds have shares worth £110 million in US arms giants linked to an alleged war crime in Yemen when 40 children were killed, we can reveal. Campaigners now believe the air strike on a school bus in Yemen last month was inflicted by a smart bomb made by General Dynamics and Lockheed Martin. We can reveal Lothian Pension Fund has £24m invested in General Dynamics and £86m in Lockheed Martin where another big council pension fund, the Strathclyde Fund, has invested £1.6m. Meanwhile, Scottish Enterprise has given Lockheed Martin nearly £200,000 in grants since 2013. Critics have condemned both the pension fund investments and the awarding of taxpayers’ money to the biggest arms company in the world. Human Rights Watch (HRW) said an air strike by the Saudi-led coalition on a bus on August 9 was an “apparent war crime” and called on countries to immediately suspend arms sales to Saudi Arabia. HRW said it received photos and videos of bomb remnants taken by a lawyer near the destroyed bus. “The photos and videos of markings visible on a guidance fin for a GBU-12 Paveway II bomb show it was produced at a General Dynamics Corporation facility in Garland, Texas, as well as other markings identifying Lockheed Martin,” HRW’s report said. The Saudis blamed air force mistakes for the bombing raid that killed 51 people, including 40 children. In an another rare admission a few days later, the coalition said another air strike on August 23 that killed 26 children was also a mistake. The admissions came as the first UN peace talks on Yemen since 2016 were stalled due to a refusal by the Houthi delegation to attend until preconditions are met. In response to mounting allegations of war crimes in Yemen, Spain cancelled sales of laser-guided bombs to Saudi Arabia last week. The move followed similar decisions by Sweden, Germany, Finland, Norway and Belgium to suspend the sale of arms that could be used in the Yemeni war. The UK has ignored repeated calls for a suspension of arms sales to the Saudis, including smart bombs fitted with laser-guided systems made in Fife by Raytheon. The Scottish Government has also come under fire for its funding of the arms sector via grants from its business agency, Scottish Enterprise. Lothian Pension Fund was criticised recently after we revealed its links to Donald Trump’s migrant detention camps, prompting calls for a radical overhaul of council pension fund investments in Scotland. The laser guidance systems for Paveway bombs are also made at arms firm Raytheon’s plant in Fife, where Scottish Enterprise has also invested in “diversification” projects. Save The Children repeated its call for an end to UK arms sales to Saudi Arabia.